We were passed this sweet antique telephone table – a piece of furniture that will likely never again serve its intended use, but makes a completely charming and compact entryway solution! Stow a basket underneath for shoes and use the little cubbie spot for electronics/chargers and mail drop. You could even add in an extra basket for mittens, sunscreen, dog leashes, etc. Finished in Annie Sloan French Linen Chalk Paint and top-coated with poly for durability. Seat recovered with new foam in a cream stripe linen. I can’t wait to see the new home this one ends up in. We have had this dresser for a few weeks and I was able to find matching nightstands in a completely different state, which was great, because its often difficult for us to work with antique full sets. Navy is definitely a trending color, but I think its timeless for decorating and will be lovely in any bedroom. The color is difficult to capture in our lighting, but its a rich gorgeous hue. I lined to drawers with lobster paper for a fun Maine accent. These nightstands fit standard box baskets perfectly to conceal anything, but you could easily store a stack of books and magazines or spare towels for a guest. Solid antique wood throughout – a very sweet set! This was a fun quick turnaround! This dated piece had some fun detailing we highlighted with stain while giving the base a deep coat of charcoal gray. The hardware is what really finishes it off with rustic jute-wrapped vintage brass pulls. This piece will hold a ton with 5 drawers and fit into any classic or contemporary scheme. The before/after here is pretty remarkable! This could be the most beautiful piece of furniture we have worked on to date. Solid mahogany, stamped internally with the Mahogany Association #225, signifying its origin from Georgetown Gallery sometime between 1936 and 1950. I love finding these pieces and figuring out exactly what they need to have a new life and live out their next decades. After storing it for a few months waiting to decide on the perfect finish scheme for this I settled on a plan to not paint one inch of this beautiful wood grain. Instead I spent hours stripping her bare and applying a gray wash custom mix of stains, glazes and waxes to tone down the deep red and highlight the grain in a new contemporary way. It is buffed to a light sheen for a velvet smooth durable finish. [pictures don’t do it justice!] I replaced all of the hardware with pewter cup pulls. A labor of love and I can’t wait to see it find a new forever home! Our business started because we refinished a hutch for our own kitchen and having enjoyed the project so much, we thought we might try doing a few more pieces and seeing if they’d sell. Who knew that a year later, this would be such a big part of our life. We came by this beautiful early 1960’s solid wood French Provincial hutch made by Basset Furniture and gave it a completely refreshed look with a rich deep gray milk paint, Queenstown Gray, by General Finishes. I knew Basil Green would be a lovely compliment for the interior whether this keeps dishes, glassware, books or collectibles. I used a glazing technique with Champagne Pearl Effects and Winter White glaze to give the green a slightly pearlescent finish. I found a graphic printed paper and finished the back of the piece as an offset. Finally, we restored the original hardware with a gold leaf. We love how this one turned out and I can’t wait to see where it finds its next home. Here’s the original magazine ad for the furniture collection. I love researching the history of everything authentic that enters the shop. Get ready to see a few pieces in this finish because it is SO much fun to do. I was reading about the trends that have come up the past few years that are expected to continue to grow and stay relevant and this aged oak look is classic, timeless and very high end. I wanted to achieve the limed/aged oak finish and began searching for some authentic oak antiques and this sweet 3-drawer dresser on casters came my way. This is a multi-step process to achieve the Restoration Hardware style, but comes out beautiful, smooth and durable with a buffed wax finish that shows the grain of the wood while overall being firmly in the warm gray family and keeping just a bit of the rustic aged detail of the wood. This is a solid antique piece with dovetailed drawers. The original hardware wasn’t suited to this style, nor was it in good shape, so I completed the piece with new pewter-style cup pulls. Stunning! I have 2 more pieces lined up to do in this as well – a coffee table and a large sideboard. If you have old oak furniture with a orange or golden finish that isn’t suiting you, bring them our way and I can transform them! Some pieces just tell me what they need and this one yelled to me – I need to be BRIGHT and FUN. I have always loved a pop of color in a room and this particular shade of bright persimmon will complement dark wood tones, blues, grays, turquoise or neutrals. I glazed it with a Van Dyke Brown to tone the color and give it some depth. This will immediately elevate the style of your room and provide ample storage for all of your cocktail mixing needs. I used durable Java Gel stain on the top and accent pieces and the interior got a finish in grey. Ryan was shaking his head when he saw me haul this piece into the workshop. It was painted 2 different shades of ivory and white and the bottom of it was chipped, broken and had visible water damage. 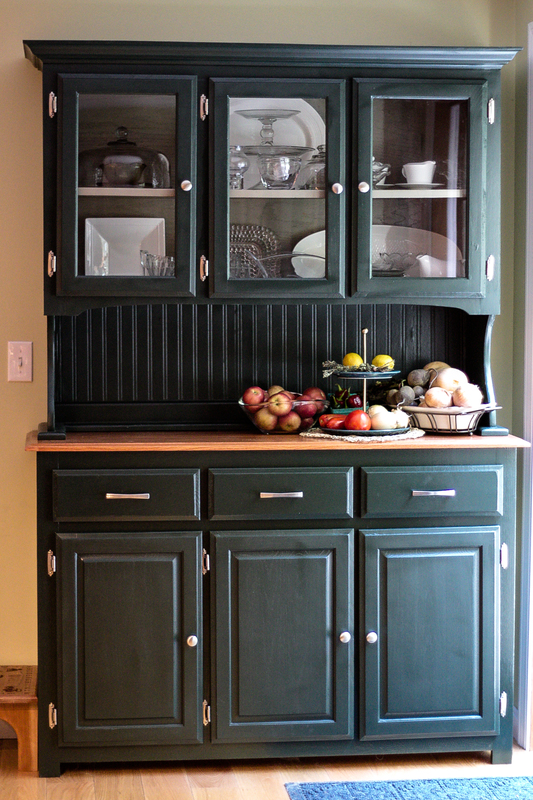 I loved the curved trim pieces, the detail on the top drawer and the smaller size of it and had a plan. We chopped off the entire bottom of the piece and reinforced it and then I added feet to give her a little stature. She got a gorgeous Lamp Black General Finishes Milk Paint and smooth glossy finish and I wrapped it up with new rose gold hardware. This paint job i hard to capture in pictures – but she really stands out. My dear friend Anna called me a few weeks ago and breathlessly asked me if I could maybe, perhaps help her accomplish a wedding vision she had for their June ceremony? Before I could say ‘absolutely’, she responded, good, because I’m basically already in your driveway. She had found 2 old wooden doors at the ReStore and showed me her Pinterest board vision and the rest is history! I was so thrilled to create this for her and her grooms special day. Knowing these were not your typically antiqued pieces, I was really able to go to town with antiquing glazing effects to bring out the drama (which is perfect for my actor friends wedding). I brought in some faux floral fun and built a custom garland and Annas friend helped stake these in place for the ceremony. I guess we can officially say Brightwork can help bring these things to life – so if you or someone you know is looking for some event decor, let me know!